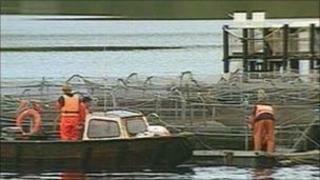 Scotland's salmon industry has said it has created hundreds of new jobs in the past year and is worth about £500m to the economy. A new report said 234 new jobs had been created and £29.5m of capital had been invested by the industry. A further £296m had been spent on suppliers and services. Salmon exports have increased by more than 500% in the past 20 years and one million fresh salmon meals are eaten in the UK every day. Scott Landsburgh, chief executive of Scottish Salmon Producers' Organisation (SSPO), said: "The research results are a major boost for the sector and the remote, rural communities that depend on a successful, sustainable and profitable salmon industry." He added: "The sector is enjoying an upward trend. The contribution to the economy is increasing in many ways. For example, over the last three years there has been a 55% leap in the direct value to communities through the rising contribution of salaries, which was bolstered by the creation of 234 new jobs in the last year." The SSPO, which represents represents 95% of salmon production, said its members were optimistic about the future. A survey found that 90% of SSPO member companies felt 'very confident' or 'confident' about future demand for salmon. A total of 78% of firms said they planned to increase staff over the next five years.